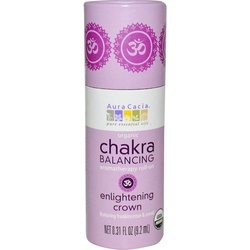 Balance emotional and spiritual energy flow with Aura Cacia organic chakra balancing aromatherapy roll-ons. These essences, tied to each of the seven chakras, can be used alone or combined with others depending on which chakra centers need to be balanced. The beautifully alluring organic essences also double as unique perfumes. Use them to create a signature personalized aromatic style. A smoky, sweet blend featuring frankincense and neroli. Certified organic.